When I tell people we are having Hamburger Carrot Potato Casserole for dinner, they say "that sounds good, what's in it?" I answer them with, Hamburger, Carrots, and Potatoes --- simple ingredients. Mother made this all the time when I was growing up, and I don't think she really had a name for it. 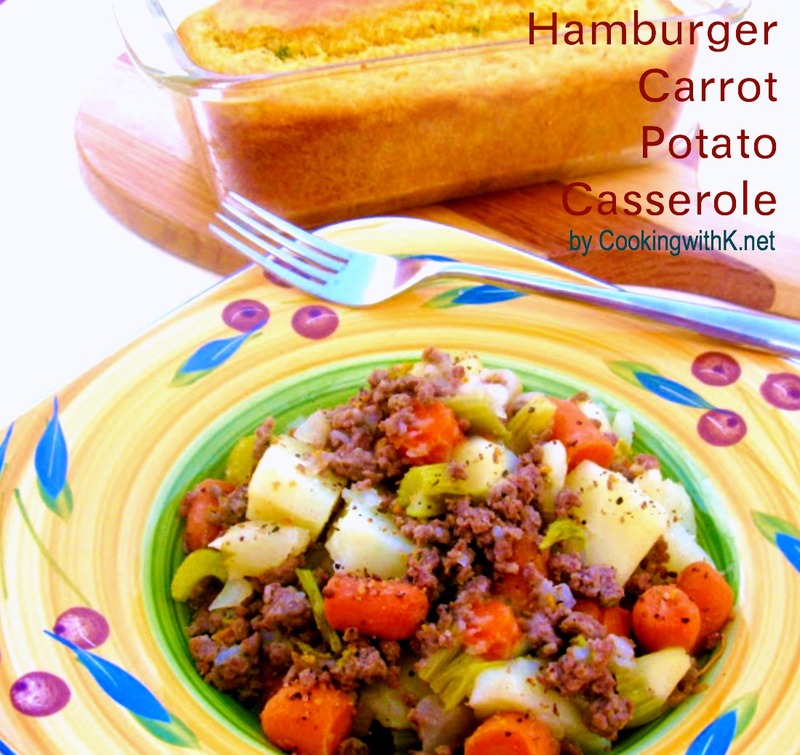 So when I started making it for my family, I started calling it Hamburger Carrot Potato Casserole. This is one of those one pot meals that the whole family just loves. Who can turn down meat and potatoes? And it is a great way to get your children to eat carrots, which I never had any trouble. I usually make a salad and serve some sort of bread to go with it. This time, I served a delicious Jalapeno Cornbread Loaf, which we made some delicious sandwiches with later. I will be posting that recipe soon. Going back to the name -- I don't know how the "casserole" became part of the name, it really is not like your normal casserole. It is more like a stew than anything. 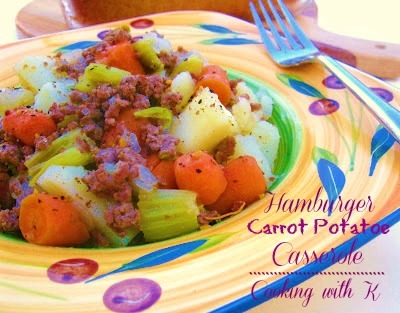 It has the most delicious juices off the meat, carrots, and potatoes that are cooked with onions and celery. Later down the road and a nudge from my DIL, I took it to a new level by adding Montreal Steak Seasoning. Now do you see what I am talking about ---- It is more like a stew than a casserole! In a large stock pot, add hamburger, onions, celery and salt and pepper; brown until vegetables are tender. Add carrots and cook while peeling potatoes, stirring occasionally. Add potatoes and Montreal Seasoning. Add water and cover simmering until potatoes are fork tender. Cook's Note: You can adjust the onions, celery, and salt and pepper according to taste. I found dinner for tonight! Don't you just love montreal seasoning? We put it on everything! Visiting from Chef In Training. I would love for you to visit me at ourhandshishands.blogspot.com! what a great recipe! I think the whole family would like this one! Now, that definitely is a comfort food! Yum. Perfect as we are still getting snow, snow, snow! Congrats on being a Featured Recipe at Weekend Potluck! Feel free to come grab an "I was Featured" button. Come see us again next weekend! This looks REALLY good, Kay & would have been perfect for our windy, cold & snowy day. We, too, ♥ Montreal Steak Seasoning...I buy it in the HUGE container from Sam's Club. I think they call it "Canadian Steak Seasoning" but its the same thing as Montreal. Yummy on steaks, too! This looks so simple and good. Love old family meals-so comforting and full of great memories. wow this is simply amazing!! Loved the recipe!! Your dish does look very delicious. I love cooking also. I have these ingredients at home too. Thanks for sharing your recipe. I am going to try this soon. I love this casserole. It has all my favorites.